Your appearance is one concern. Another is that the gap made by a missing tooth can be the threat to your oral health. A gap can also affect your bite because the teeth next to space can move into the gap and alter the way the upper and lower teeth bite together. This can lead to food being stuck in the gap, which causes both decay and gum disease. This depends on the number of teeth missing and on where they positioned in the mouth. There are mainly two ways to replace the missing teeth. The first is with a removable false tooth- a partial denture. The second is with a fixed bridge. 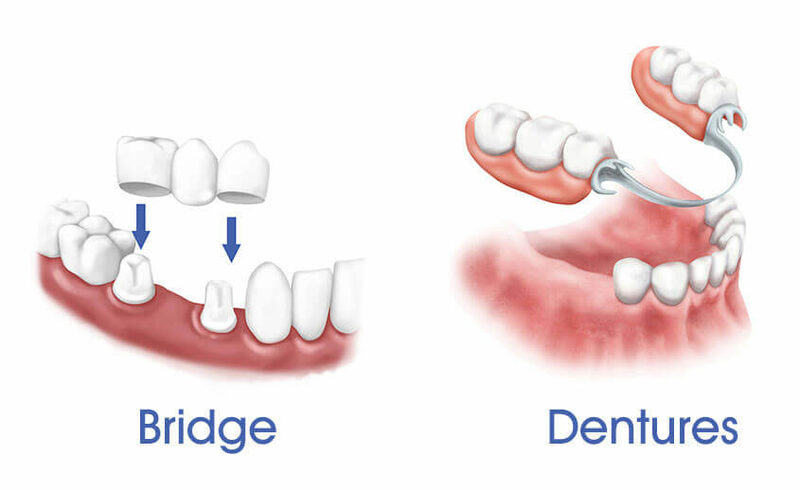 A bridge is usually used where there are few teeth to replace, or when the missing teeth are only on one side of the mouth. These are false teeth attached to the plastic gum-colored base. It may be made from plastic or a mixture of metal and plastic. Both types may have clasps that help to keep the denture in place. Depending on where they placed, some of these clasps may appear when you smile or open your mouth. What is the difference between a plastic or metal base? Plastic partial dentures are less expensive to make. But unless they are designed very carefully they can cause some damage the supporting teeth. Metal partial dentures are usually made from an alloy of cobalt and chromium and they are stronger to hold in place. You feel lighter to wear and can be supported by the remaining teeth. Though the base is metal, they are pink-shaded (Similar to the gum color) and natural- looking false teeth fixed to them. They are a little expensive than plastic ones. How do I choose a suitable type for me? Be guided by your dentist. He or she will know the condition of your remaining teeth and will be able to advise you on your individual situation. In most cases, a metal-based partial denture gives the best result as it doesn’t damage much. Can I have a bridge fitted right after a tooth extraction? In many people, it may take up to 6 months for the gums to heal completely after tooth removal. This means that you may need to have a temporary denture for 6 months before the bridge is fitted. How do l look after my denture? The general rule is brush, soak, brush. Always clean your dentures with proper care. You can do with a bowl of water or a folded towel in case you drop them. Brushing your dentures before soaking will help to remove any food debris. If you have stubborn stains on your denture use of an effervescent denture cleaner, this also gives the feel of freshness– don’t forget to follow the manufacturers’ instructions- then brush the dentures. As you care your natural teeth, be careful do not scrub too hard as this may cause grooves In the surface. Most dentists advise using a small to medium headed toothbrush and toothpaste. Make sure you clean all the angles & surfaces of the dentures, especially the surface which comes into contact with your gums. This is important if you are using any kind of denture fixative. If you notice a build up of stains, have your denture cleaned by our dentist or hygienist. Should l take my denture out at night? Your dentist may recommend removing the dentures at night. This gives your mouth a chance to rest. When you remove your dentures, it is important to leave them in water to prevent any warping or cracking. The main alternative is a fixed bridge. This is made by placing crowns on the teeth at either side of the space and then joining these two crowns together by placing an artificial tooth in the space. The artificial crown is made in the laboratory and then cemented into place with help of adhesives. The bridge cannot be removed for cleaning. Another option is a bridge. This contains wings that are bonded to the back of the supporting teeth with very little drilling involved. Can l always have a bridge to replace missing teeth? Bridges are only possible when you have potential strong teeth with good bone support. Your dentist will help you choose which is the best way of replacing missing teeth. 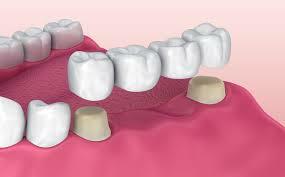 Typically bridges are made of porcelain bonded to the precious metal. In some cases, other non-precious metals also can be used in the base for strength. There are also new bridges made entirely of a special type of strong porcelain to match the tooth shade. Costs will vary depending on the size and type of bridge you need. Always get a written quotation and treatment plan before beginning any dental treatment. Although a bridge may seem a bit expensive it should last many years. How do I look after my bride? You need to clean your bridge every day as you do with your natural teeth. Brushing and cleaning can prevent problems such as bad breath and gum disease. You also have to clean under the false tooth every day. Your dentist will tell you how to use a bridge needle or special floss, as a normal toothbrush cannot reach. 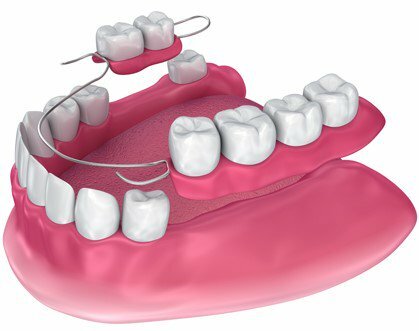 There are other methods to fix the gap, such as using crowns and partial dentures that can keep the retaining clips out of sight. Every person’s condition varies, so you should ask your dentist about them. Can l have teeth which attach to the jawbone? Yes, by having implants. The benefit of this technique means you will be able to replace missing teeth without crowding other teeth. Remember that it is as important to care for your remaining teeth also even after replacing the missing ones.